When Emptac set their sights on creating the ESt1, they did so with you in mind. 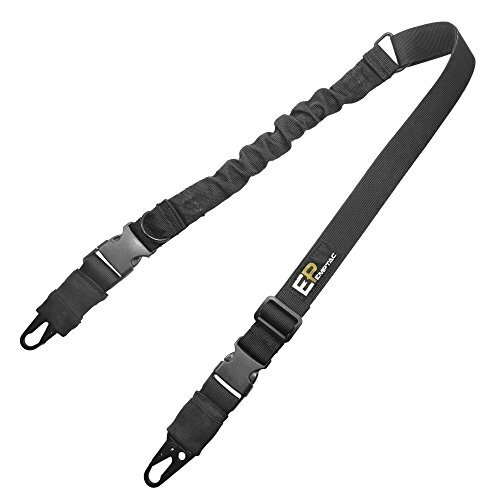 The ESt1 rifle sling is versatile, modular and simple, so that it works whether you're using it for hobby, hunting, sport or duty. The sling was designed with modular attachment choices, and an ideal length adjustment range. Our fully ambidextrous sling can fit practically any rifle and body type, male or female. Most similar slings came a little long, we took a couple inches off to make it carry in a more comfortable center for most users. Adjusts from 44 to 55 inches. Custom stainless steel attachment clips with a wider opening to fit standard mounting points. Our sling also only has a single 'springy' elastic strap, cutting down significantly on the bounciness when maneuvering with it attached while still absorbing the weight comfortably. The rifle sling is made from 1.25 inch waterproof nylon with custom stainless steel clips. Quick length adjust strap and instant release buckles for comfort and easy release of the gun sling. The 2 point sling features steel D-rings and 1 inch hooks for multiple configuration options. Can be used as a range or camera bag strap, or an emergency bit of rope. Good for airsoft or a gift. Custom Design: See product description for complete specs on the ESt1 black rifle sling. If you have any questions about this product by Emptac, contact us by completing and submitting the form below. If you are looking for a specif part number, please include it with your message.